I’m back with another townhouse update!! It feels like I have been talking about this house for forever (but really… we purchased back in September 2015) but we’re finally getting close to moving in. ALMOST!! I thought I’d share another update with you guys because it’s been a while so let’s check out the progress, shall we?? By early December, our exterior was pretty much finished!! As you can see, it’s very modern and has TONS of windows. The orange accent is a bit funky but it adds a fun pop of color. They still need to finish the tile and railing on our rooftop terrace. Since my last update, we have gotten a kitchen… and paint!! 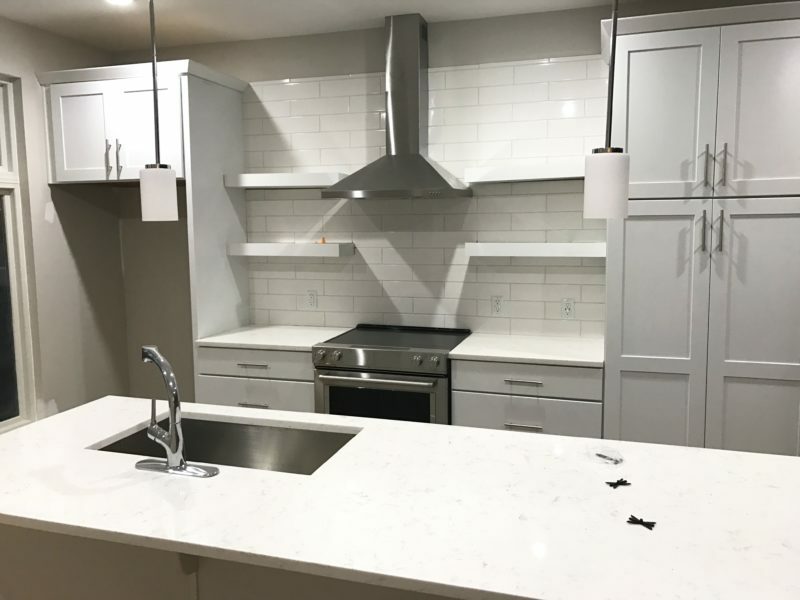 When I first walked in and saw the white cabinets and white countertops, I got all the heart eyes! I love the fresh and clean feeling of an all-white kitchen. 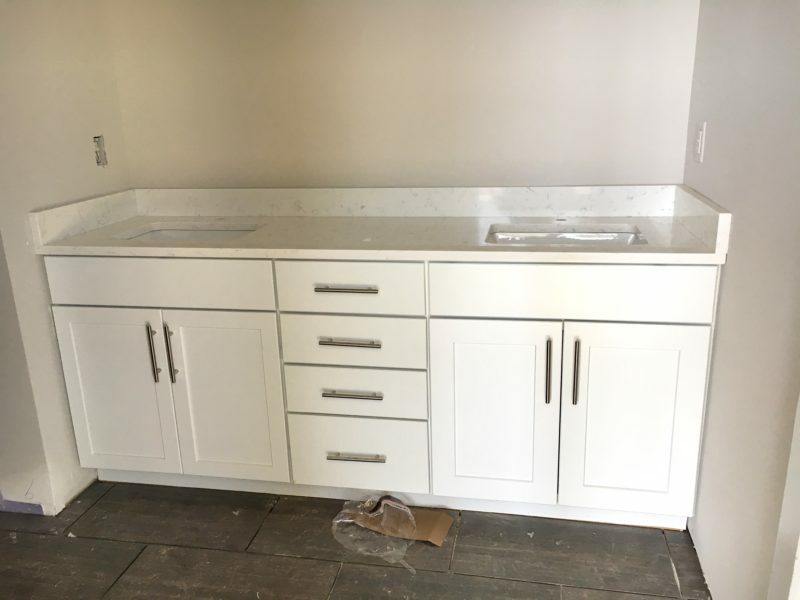 I’m also super excited about the double sinks in the master bath and just look at all those drawers. At first the designers told us they wouldn’t have room to have drawers and I was not a happy camper, but thankfully they came through! We also have floors! Well, the hardwoods at least. You can’t see them because they’re covered up with the cardboard but they look good from what I can tell. I can’t wait to see how the kitchen pops against the dark wood. 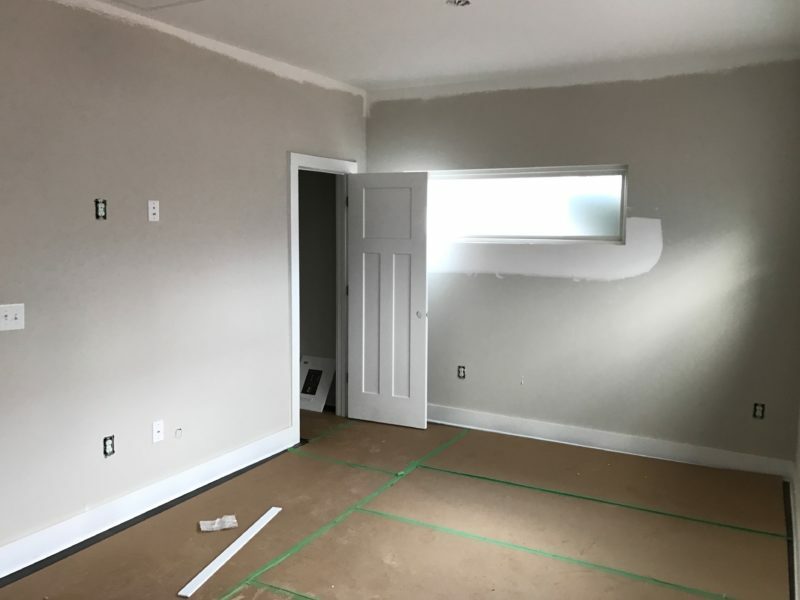 They have also started doing the trim which you can see in our downstairs guest bedroom. 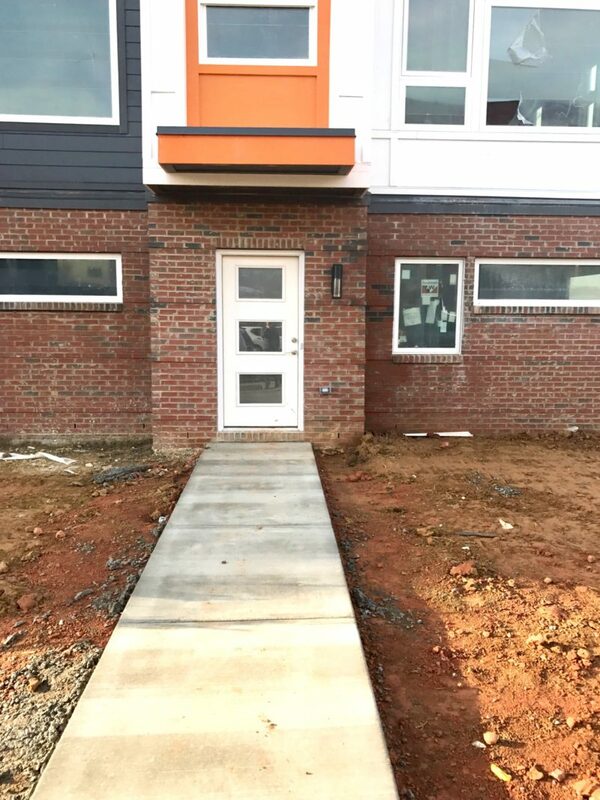 They have bulldozed/flattened the mud in the front yard and sidewalks are in so now we have a little path to our front door. Hopefully sod will be next! The outdoor light is new too and we have electricity. They have also started staining the stairs and I love how they look! It has been really neat to see our place being built from the ground up but… we’re so over the waiting. And would you believe they STILL haven’t given us a move-in date?! 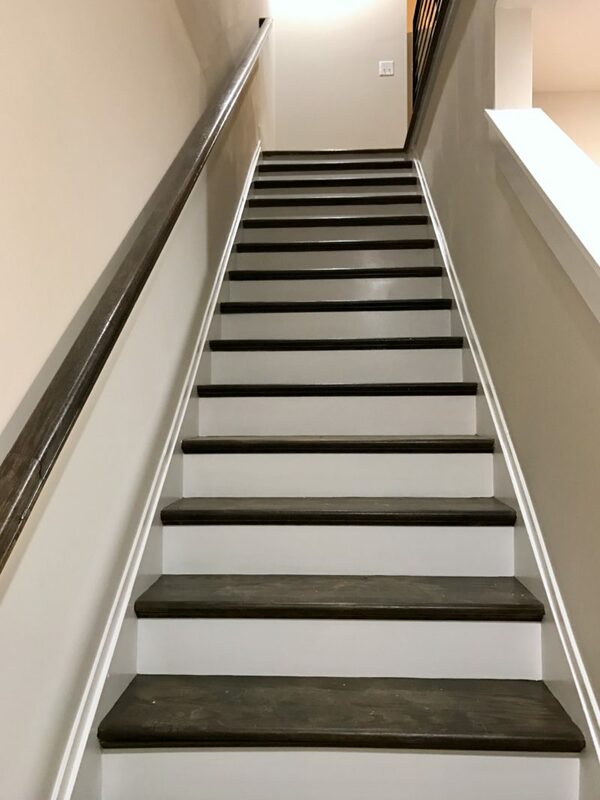 I mean, all that’s really left is the upstairs carpet and another fresh coat of paint. Oh, and of course fixing all the little mistakes they made along the way. Oh, the joys of home owning. Hopefully we will get a closing date very soon and until then, I’ll be praying to the real estate gods! Girl. That kitchen looks AMAZING. 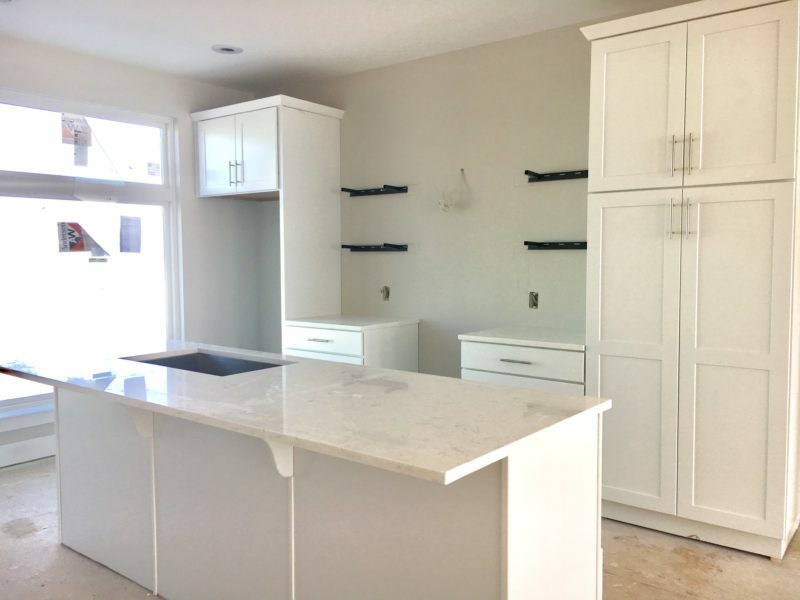 I can’t wait to see how it all looks once it’s said and done – the dark wood floors are going to look so great with the white kitchen! Hopefully y’all won’t have to wait too much longer before you have a move in date! It looks so good! That kitchen is just gorgeous! I can’t wait to see a home tour when you’re all moved in! It is really coming together. This is so exciting! 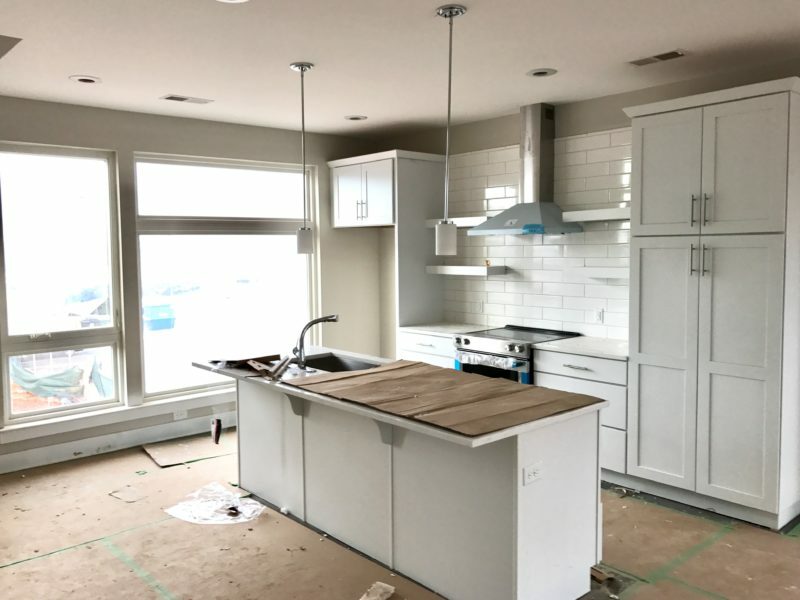 Love the kitchen design so far! Oh my, so fun and exciting to get to watch your place be built. You’re gonna love that kitchen, the white is fabulous! Your floors will be a gorg addition too. Super happy for you! Yay! SO close! That white kitchen is perfection. Wow!! It’s looking amazing!!! I bet y’all are just so excited! Can’t wait to see if finished! That kitchen is gorgeous! I bet you are dying to move in!! 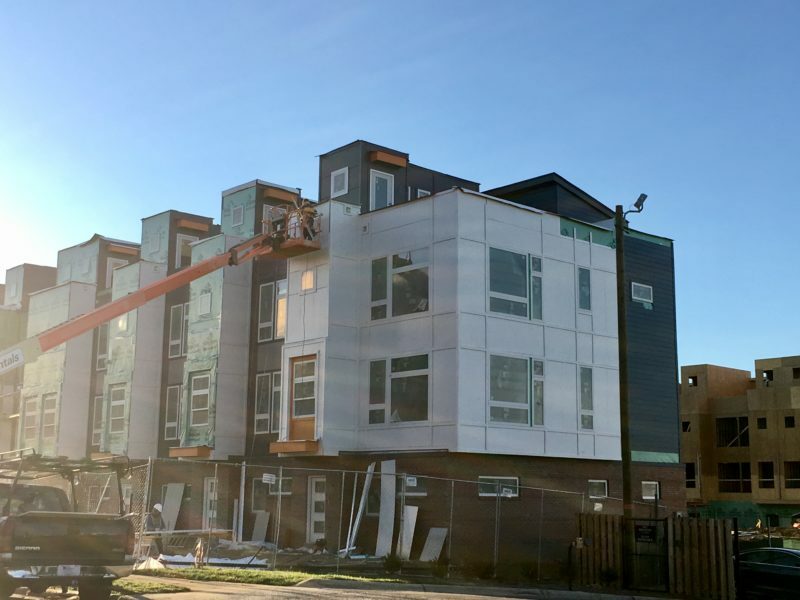 Can’t wait to see what it looks like when it’s finished! Oh my gosh I LOVE your kitchen! All white + the subway tile back splash are just perfect! This is so exciting, that kitchen is a DREAM! Oh my gosh… the kitchen!!! I’d be impatient too but that is worth the wait!! GORG. It looks like your home is going to be absolutely stunning!! Love the all white!